In an interview provided to French Canadian paper Les Affaires, Air Canada business analytics leader Chantal Berthiaume described the new approach they are taking to understanding consumer motivations: language experimentation. Working with Persado, which uses a state of the art AI platform to create messages that will emotionally engage consumers, Air Canada marketers went beyond testing the typical two email messages to 32 versions, giving them enhanced ability to examine how their audience would react to different kinds of emotional language. “Using 32 versions of an email, we measured the impact of email messages that elicit the emotions of exclusivity, safety, gratitude, intimacy, curiosity, and anxiety. To our big surprise, words of anxiety gave the best results,” Berthiaume told Les Affaires. 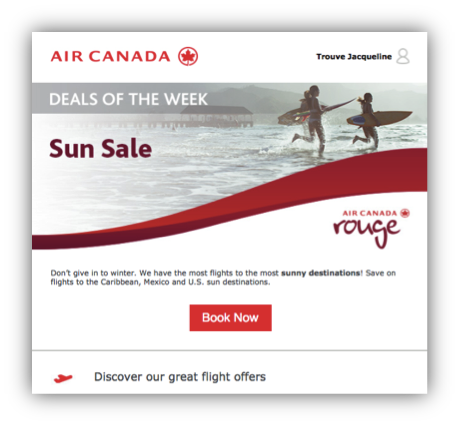 Additionally, click-throughs were almost 220% higher when Air Canada directed consumers to “see deals” versus to “book now” in the call-to-action button of the email. In generating tens of millions of messages for different marketing channels, and using machine learning to understand what does and doesn’t work with consumers at scale, Persado has found that emotional language is by far the most powerful trigger of action, on average responsible for 60% of performance. 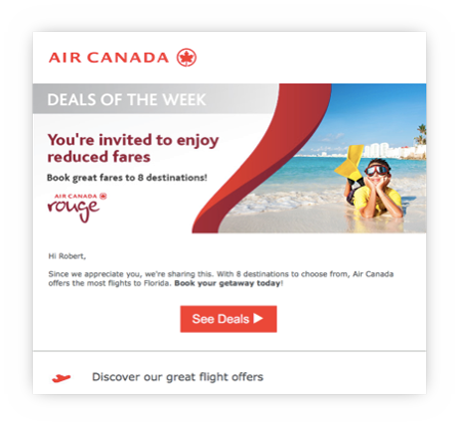 The platform is also able to isolate the contribution of other message elements, such as call-to-action language (as seen in the Air Canada example), formatting (stylistic elements including symbols and emojis), positioning (structural placement of words and phrases), and product/offer/service description. This data-driven understanding of how different words, phrases, images, or even colors might resonate with consumers is a powerful tool to make marketing messages more delightful, more arresting, or in general more relevant to the audience a brand seeks to connect with in a meaningful way. Air Canada is looking to explore how to wield the power of language to enhance experiences and improve response in other scenarios such as seat upgrades, and later, their loyalty program when it launches in 2020. For more information about Persado’s content generation platform and how brands use emotional language to increase short-term engagements and build lasting relationships, email info@persado.com.